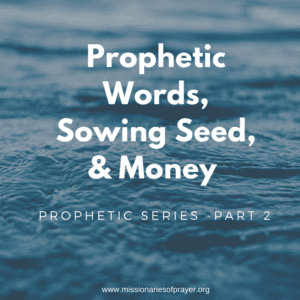 This post in Part 2 of the Prophetic Series and it will cover the of Prophetic Words, Sowing Seeds and Money is a very important topic that must be addressed. If you missed Part 1, which will teach on the gift of prophecy, you can read it here. I have to start off by sharing some statistics which will help you gauge the ministries and churches that you support. What does this mean to you? It means that the first 5 things most of you do every morning 3/4 population of the world can’t do it! You turn on the light. You have electricity? You use the toilet. 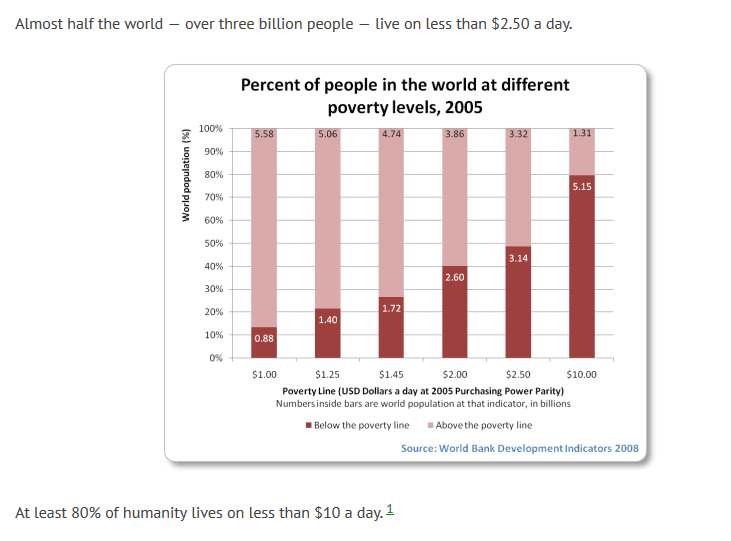 3/4 of the world don’t have toilets that is a luxury. You take a shower. Wait, running water? I think most people don’t consider the wealth they are living in. How the simple things in life to us is a luxury for most of the world. And the truth is we didn’t get to choose where where we were born – the family or the country. That was God’s doing. His providence. 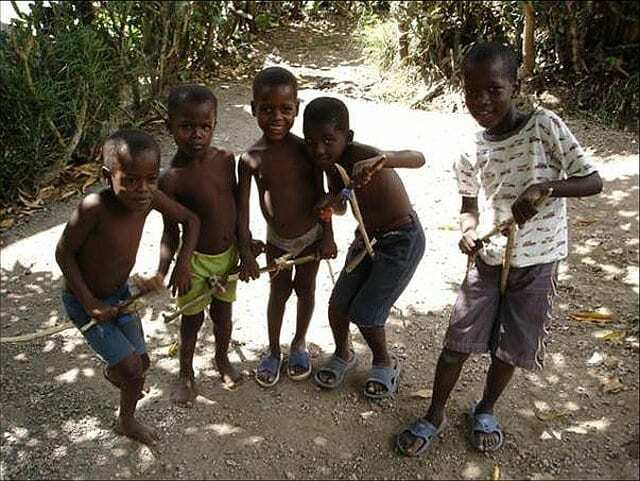 I want to share a story with you about one of the mission trips I took to Haiti. We finished with our medical clinic for the day and later that evening a group of us decided to go for walk in the neighborhood. As we came around the corner to a house shop, they have house shops in most neighborhoods they don’t have supermarkets. So an individual would make a little room where they create a grocery store and stock regularly used items, bread, rice, flour, oil, for people to buy. 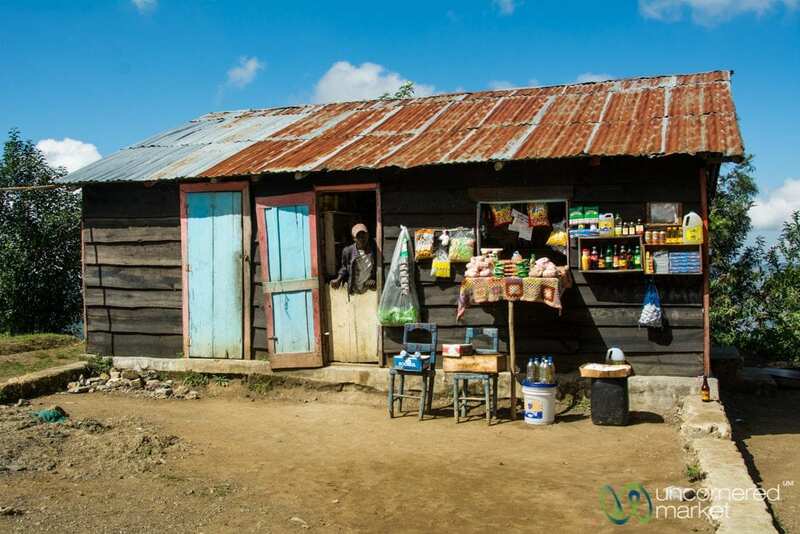 A little shop that sells everything on the way from Seguin to Port-au-Prince, Haiti. Well, this particular house shop owner had a television inside his house. What he did to attract customers was pull the television closer to the front door of his house so that it could be seen from the road and open his front door so that the people standing outside could watch the TV from the street. Obviously, these people don’t own a television so the only place they would ever see what was going on in the world was on this TV from the house shop. Now imagine this scene, there are about 40 – 50 little kids all piled on top of each other in the street trying to get a glimpse of the screen. Whenever a bike or the occasional vehicle would come by they would all have to get up so the vehicle could pass and then regroup and hopefully get a good spot to continue watching the TV. As we are walking towards them someone in the group said, I wonder what they are watching? As we get closer and with the volume being on full blast we hear that it is a Christian TV program. I was so happy that this shop owner had the station on a Christian channel and we decided to stand in the back of the children to hear what was being said. God doesn’t want anyone to be poor. We immediately walked away. We were so mad and disgusted. I cannot describe the anger. I went from being angry to weeping for those kids. When we move away from the main message of Christianity, which is Jesus Christ and salvation we inevitably go astray. Keep the main thing the main thing. Salvation can be preached anywhere. Poor people have some of the highest faith level I have seen. Why? How else are they going to eat if they don’t believe God for their next meal? How else are their bodies going to be healed when they have no money for medicine and doctors? They have to believe for the impossible because they have no other choice. “When you happen on someone who’s in trouble or needs help among your people with whom you live in this land that God, your God, is giving you, don’t look the other way pretending you don’t see him. Don’t keep a tight grip on your purse. No. Look at him, open your purse, lend whatever and as much as he needs. Don’t count the cost. Don’t listen to that selfish voice saying, “It’s almost the seventh year, the year of All-Debts-Are-Canceled,” and turn aside and leave your needy neighbor in the lurch, refusing to help him. He’ll call God’s attention to you and your blatant sin. So yes, poverty is a real part of life so when you think about a worldwide ministry always remember that not all of your audience is going to be rich. Most of them won’t have anything. Technology is a wonderful thing and God created it so that we would be able reach more with the Gospel without actually seeing them or having a large Television budget. The internet and social media has leveled the playing field. You no longer need to be Billy Graham or Rienhart Bonnke filling stadiums to reach billions. No, now all you need is one video to go viral and you can double their numbers. This is the gift that God has given us for at such a time as this but we need to be mindful of our audience. They have cellphones in these countries too – they can see your YouTube Videos and your Facebook Live. They see you on Instagram. Think about what you are prophesying and preaching. Now on the subject of giving a prophetic word and the asking people to sow a seed into the word. This is not good. By doing that the prophet just asked people to pay for the message. To sow a seed to activate a message says that there is some unlocking of the message that happens after you give them money. What if the person listening to the message has no money? Does this mean that you then don’t receive the blessing? Then they say there are 100 people who will give a $1000, 50 people who will give $100 as if people who give a certain amount will somehow get an even greater blessing. This takes it a step further by peddling God’s word to the highest bidder. Creating an atmosphere that there is some elite club in the Kingdom of God based on the amount of money you can give. 7 As you go, preach this message: “The kingdom of heaven is at hand.” 8 Heal the sick, raise the dead, and cleanse those who have leprosy. Drive out demons from the possessed. You received these gifts freely, so you should give them to others freely. 15 He said, “Behold, I know that there is no God in all the earth, except in Israel; so now accept a blessing and gift from your servant.” 16 But Elisha said, “As the Lord lives, before whom I stand, I will accept nothing.” He urged him to take it, but Elisha refused. After Elisha refuses and leaves, his servant Gehazi decides that he wants the gift so he goes behind Elisha’s back tells lies to Naaman to get the gift. What happens after that is Gehazi gets struck with Leprosy (cursed) for doing this. So when you accept money in exchange for using your spiritual gifts, you are aligning yourself to a curse! Freely you have received and freely you shall give. 18 Now when Simon saw that the Spirit was given through the laying on of the apostles’ hands, he offered them money, 19 saying, “Give me this authority and power too, so that anyone on whom I lay my hands may receive the Holy Spirit.” 20 But Peter said to him, “May your money be destroyed along with you, because you thought you could buy the [free] gift of God with money! When you try to pay for the spiritual gift you are aligning yourself to a curse! When you don’t know, you just don’t know. And, the “sowing a seed into this message I’m giving you now” is so rampant today with the internet and social media. The sad part is most of the preachers, prophets or teachers that are engaging in this behavior don’t know these scriptures. They actually don’t know that they are activating a curse on themselves…and you. I find that most Christians that are doing this are just being copycats. They see others doing it and they start doing it too. This ministry gets money by saying this, so I am going to say this too. This ministry is doing Facebook Live, so I am going to do Facebook Live too. This ministry does YouTube videos to release prophetic words and look how many followers they have, I’m going to do YouTube videos too. This ministry sells T-Shirts to make money, I’m going to sell T-Shirts too. Just copying what other people do. Therefore, when this ministry goes over the cliff they are right behind them. Apart from God we can do nothing! If God has not given you a personal word on how to operate the ministry that He has given you, which platforms to use or not to use, you shouldn’t be doing it. 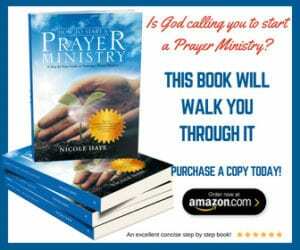 Get into the secret place with God and get your own blueprint for your ministry and your church. The next time, you read something, watch a video and they end the video with sow into this word….I don’t care how anointed you think they are you shouldn’t engage in that type of giving. If you follow this principle alone, you are going to weed out many of them. Then you look at the ones left standing and now you will start to become more clear. Watch the clarity that will come to what God is saying when you weed out these people. So what does this mean? If I give you a prophetic word and you receive the word and follow through on the instructions then you will receive the reward for receiving the word. Because God will bless your obedience to the word. That is the reward. The scripture also says if someone welcomes a godly person they receive his reward as well. What does this mean? If you as a godly person share Jesus Christ with someone, they then welcome the message and get saved… that is a reward! It goes on to say when you see a humble disciple of Christ and you give him a cup of water God will bless you as well. So at the end of the day, receiving a prophet to receive the prophet’s reward is basically receiving the prophetic word. This is not sowing into the word it, is just receiving the word. That’s it. This is ironic because godliness, along with contentment, does put us ahead but not in the ways some imagine. You see we came into this world with nothing, and nothing is going with us on the way out! So as long as we are clothed and fed, we should be happy. But those who chase riches are constantly falling into temptation and snares. They are regularly caught by their own stupid and harmful desires, dragged down and pulled under into ruin and destruction. For the love of money—and what it can buy—is the root of all sorts of evil. Some already have wandered away from the true faith because they craved what it had to offer; but when reaching for the prize, they found their hands and hearts pierced with many sorrows. Heal the sick, raise the dead, cleanse the lepers, cast out demons. Freely you have received, freely give. Does this mean that we shouldn’t be asking for or accepting donation for ministry? The short answer is no, it doesn’t mean that at all. We are to pay our tithes. We are to make offerings. (Malachi 3:6-12) We are to give to churches and ministry….as the Lord leads you to do so. Be obedient. Give and it shall be given to you (Luke 6:8). BUT, your giving must never be out of compulsion. God loves a cheerful giver (2 Corinthians 9:7). You must give because you are being fed and growing spiritually from a ministry and not because you feel you are going to miss God if you don’t. This thinking is wrong. You give because you like the mission of the ministry or church and you want them to continue. It is He who gives seed to the sower, so when you get your seed you give. No seed, no giving. You are not going to be punished for that. God is not some evil task master asking you to not pay your credit card bill and instead give the money to a prophet. No, go and pay your bills!! Are you paying your tithes and making an offering on a credit card? Do you believe that God would have you accrue interest and ruin your credit just so that you can give Him money? Where is the wisdom in that? The root of this type of giving is fear. Do you think God wants you to give out of a spirit of fear? No. He loves you so much more than that. Start praying and asking the Lord for the gift of discerning of spirits so that you can discern the source of prophetic messages once you discern the source, you know exactly how to respond. These are the spirits I usually discern after these prophet words or messages – fear, greed, mammom, lust, pride…and the well-meaning copycat Christian! There is no sowing into a word to activate anything! If the word the prophet is giving is from the Lord, it is immediately activated once it is released. ***Please note, this does not apply to buying conference tickets, buying a book from a prophet or paying for an online school. These things cost money to produce. The event location needs to be paid for, refreshments, staffing for events these are the things you are paying for when you purchase the ticket. Publishers are not free so when you purchase a book there costs associated with that; therefore, you need to pay for the book. Use wisdom. Next Wednesday we will look at the different ways prophets receive the word from the Lord. I hope this will cause you to think about where you give. Please share in the comment below. Did you learn something new? I have really enjoyed reading all your series . It has been very open and thought provoking . . Thank you . For the first time I’ve found a prophet/intercessor who makes sense. Thank you so much. My spirit has always disagreed with this kind of giving, and the moment a servant of God begins to talk about it, I always lose faith in them completely. Thank you for this. You have confirmed what we have long held to be true. People have debts then they are encouraged to give to the church or a ministry ‘so that they will receive a harvest’ but nothing happens and they go more into debt. Wrong teaching? Already suffering under guilt they then become angry and leave the church community. How sad. God Lead you higher and higher in revelation and knowledge. I have found myself in church where giving a seed to active blessing and so on, but there was something that would tell me otherwise instead I wouldn’t engage. I thank God I didn’t and I’ll pray even harder to not fall victim to such in future. I have paid for prophesy before. I pray that God will reverse all curses associated with it. I am no longer at that church though.